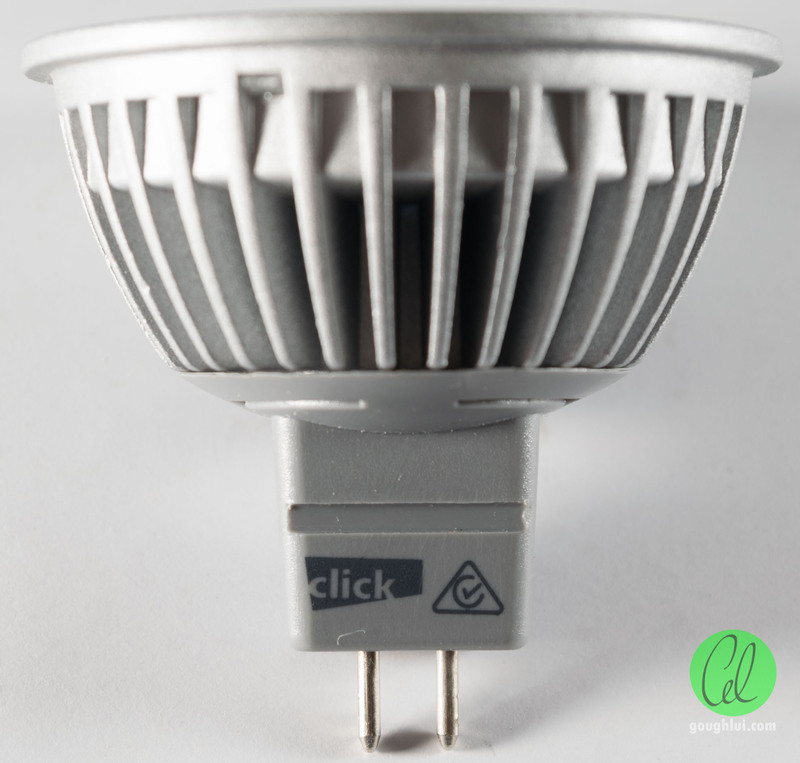 Throughout LED lighting’s journey towards mainstream adoption, several generations of end-user retrofit globes have been produced by many companies in a wide variety of configurations for simple “plug and play” upgrades. Unfortunately, these globes were not always of the quality users would have come to expect, and given the high price of early adoption, these have turned some users away from LED technology entirely. 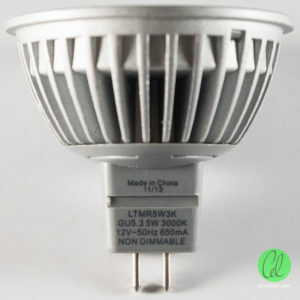 This week, a good friend of mine and reader of this website personally submitted a single failed Click LTMR5W3K GU5.3 base 5W 3000K CCT LED MR16-replacement globe for post-mortem analysis. Apparently, several of these globes were installed and they were beginning to fail with some regularity, and he thought I’d be interested to find out what’s going on. This globe looks like any regular MR16 retrofit globe. It has an aluminium finned heatsink area just behind the front for heat dissipation, and the current driver is housed in a plastic section just behind. The front of the globe is covered by a matte white plastic diffuser, with the LEDs somewhat visible. This globe was Made in China and has a date code of Week 11 of 2013, making it roughly three years old. Assuming continuous operation, this corresponds to a maximum of 26,280 hours which is around the “quoted” lifetime of most products, but I bet this product was used only intermittently. Assuming a normal 3-hours a day usage, it only survived 3,285 hours, which is barely more than the 2,000 hours a normal halogen globe is specified for. Overall, it seems likely that this globe had fallen well short of the end user expectation based on the packaging (which often quotes 15,000+ hours). The front cover easily comes off, being secured by plastic edge clips. The globe has a plastic retaining ring which is screwed in with four screws (already removed) and siliconed into place. 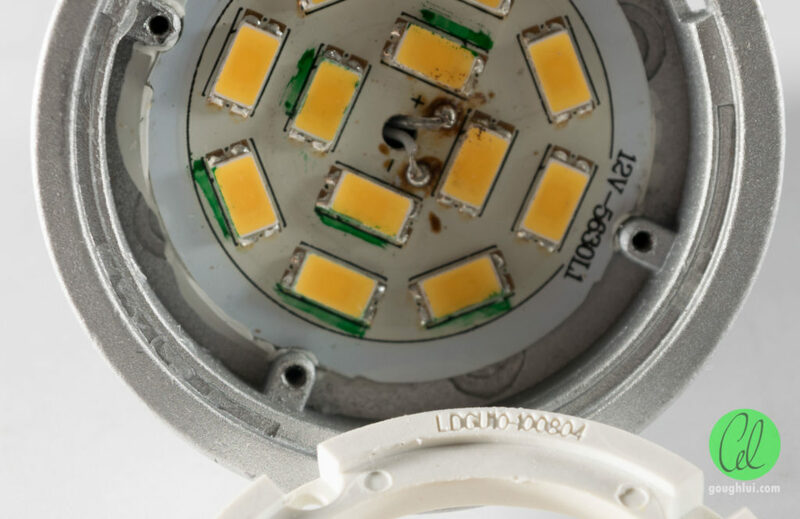 A total of 12 x 5630-type SMD LEDs is used to make the array. 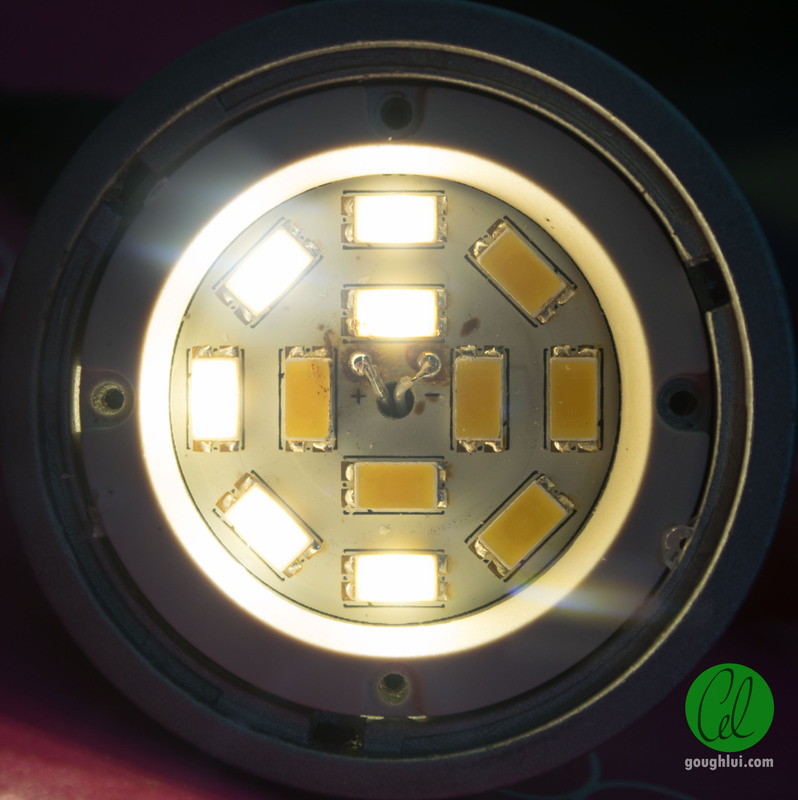 According to rough specifications, a 5630 SMD LED is good for about 0.5W output, so the array is capable of 6W (theoretically) depending on the actual component used. The current driver connects to the MCPCB through two soldered wires, indicating the current driver has one channel only. The next step was to find out exactly what the lamp does – was it an outright failure, or a partial failure? To find this out, I decided to plug it into a bench-top supply set to 12V DC (despite the AC claims on most lamps, they will operate correctly from DC). Overall, only half the LEDs were operational, and the remaining half were almost visibly noticeably running over-brightness because they were soaking up the additional current that would have gone into those failed strings. To diagnose the fault, the first thing is to determine the operational status of the LEDs and the configuration of the board. By tilting it with light coming from the side, the printed traces were drawn to determine the configuration, and continuity testing with a Keysight Technologies U1241B digital multimeter revealed the operational status of the LEDs. The MCPCB had the twelve LEDs arranged as four parallel strings of three LEDs each. In this arrangement, there is a potential for current imbalance between the parallel strings because of manufacturing variances resulting in different voltage drops resulting in uneven current sharing, and thus extreme derating is often preferred in this case to avoid overstressing the string with the lowest voltage drop and potentially opening up a failure “cascade”. This arrangement seems to have taken the parallel string connection arrangement to its extreme without any special current “balancing” feedback system (which could be as simple as a few resistors which would drop a little more voltage on the strings with more current, balancing them out). In total two LEDs had failed open circuit, with both LEDs part of two separate strings, resulting in four functioning LEDs being unlit (as the series arrangement prevents them from obtaining current). No LEDs had failed short circuit at the time of test. It was not believed that the failure happened simultaneously – it seems likely that one LED in one string may have failed first as a short (e.g. semiconductor junction failure) which caused it to hoard enough current to burn out the short and make the LED go open, or alternatively, it failed open due to a failure within the package (e.g. wire bond failure). Once the first LED went open, each of the three remaining functioning strings was forced to accept 33% more current which caused them to be further stressed and hence accelerates the rate of failure, while simultaneously resulting in the LEDs operating outside their specifications at a less efficient operating mode, resulting in more heat production localized into a smaller area of the MCPCB. This causes a slow “cascade” failure until enough strings are lost to disturb the regular operation of the globe. In this case, the loss of two strings, was enough to cause the globe’s operation to become erratic. This is likely because the current driver circuitry was being overtaxed and could not operate at its configured current without breaching its maximum output voltage limitations resulting in discontinuous operation and flickering. When the ring was removed from the globe, a marking of LDGU10-100804 was found, implying this part is common with another product produced by the same factory with a GU10 base. Searching on this code did not yield any information about the manufacturer, and neither did searching the code on the MCPCB – 12V-5630L1. 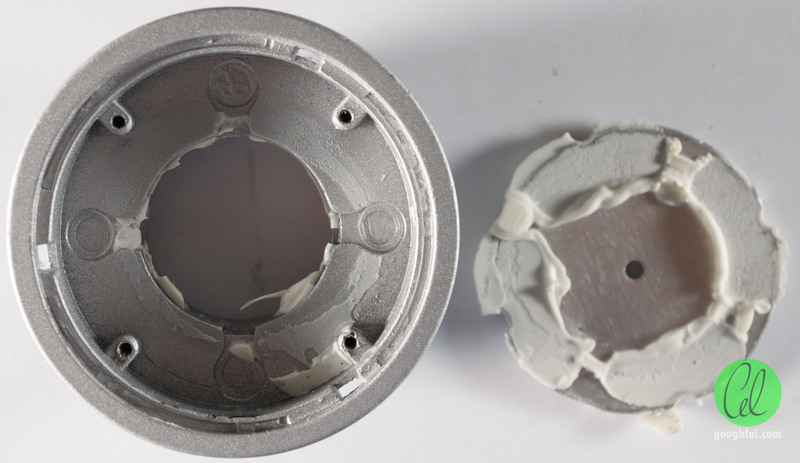 Further taking the globe apart was complicated by the use of adhesive silicone, although a route of entry was found by prying away the rear plastic body from the heatsink housing and cutting away the connection leads. This allowed the board to be removed from the heatsink. An exacerbating cause of failure may have to do with the heatsink arrangement. 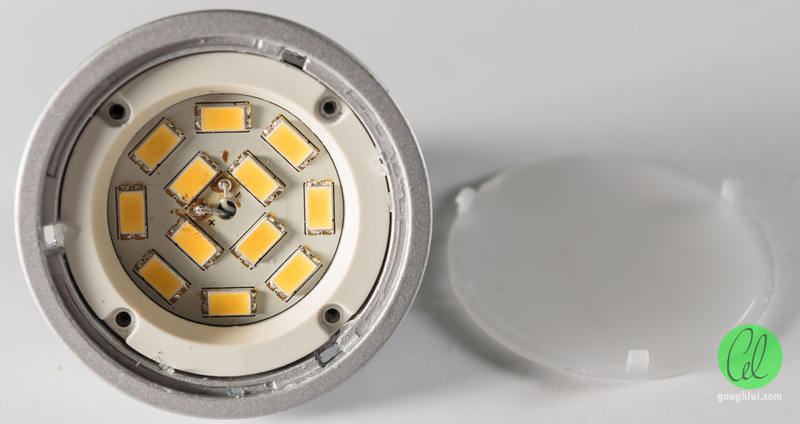 The contact area is mostly around the edge, which means that the LEDs in the centre are likely to be running warmer, resulting in a different voltage drop and current share compared to the LEDs on the outer edge. As the four parallel strings are not evenly radially distributed with some strings mostly towards the outside edge, this design is likely to have contributed to current imbalance. Further to this, the “adhesive” used is white silicone rubber adhesive which is commonly used to immobilize large components on PCBs. It does not appear to be a type optimized for thermal transfer – as most of these are generally quite grainy and brittle owing to the high metallic content to improve thermal transfer. The one applied to this unit was somewhat soft and pliable, and did not appear to make a thin coating at the interface which would be expected from a good thermal interface. This would have likely contributed to higher-than-necessary operating temperature of the LED array, accelerating its failure. Of course, the quality of the LED chips are also called into question when two of them have failed on the same board, however, given the lack of operating margin (~16.7%), a single failure would guarantee the remaining LEDs would be overstressed, so further cascading failures are to be expected. The thermal imbalance may have consumed the majority of this margin although I cannot tell for certain. The current driver was housed in the rear plastic segment, generously filled with the same white silicone adhesive. This proved rather challenging to dissect without causing damage to the board that would hinder analysis, and required copious use of side-cutters, hobby knives and pliers to gain access. The rear side of the board features a 16v 330uF Aishi RS series 105 degrees C electrolytic capacitor, and a fuse. 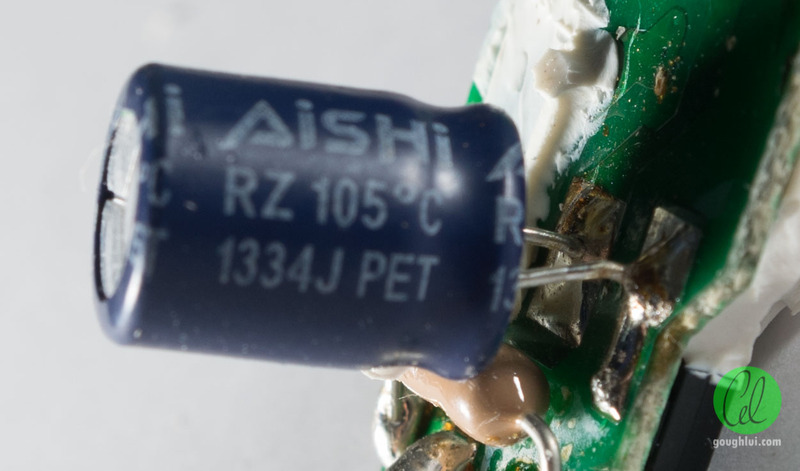 The capacitor is dated Week 34 of 2013, and Aishi capacitors are generally not problematic as they are also regularly used on Philips/Tospo lighting products. 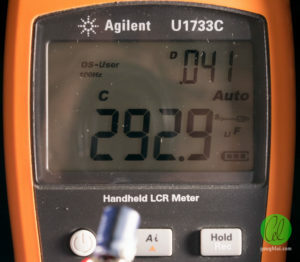 The choice of 105 degrees C is a good idea to optimize the lifetime of the capacitor, however, they seemed to have failed when it came to voltage selection. Out of interest, the performance of the capacitor was measured on an Agilent Technologies U1733C which showed it had 292.9uF capacitance (88.76% of rating, within 20% tolerance) and an ESR of 0.2233 ohms at 100Hz (likely a fail, maximum 0.17 ohms at 100khz, normally impedance goes up as a function of frequency which likely indicates this sample may have been subjected to excessive ripple – e.g. from an underloaded electronic transformer). Assuming an input of 12v AC-RMS, the peak voltages will reach 16.968v. The capacitor voltage rating is very borderline, as an old iron transformer can easily put out 10% more when faced with mains swell (overvoltage) conditions, and electronic transformers put out spikes severely in excess of this especially when run underloaded, with 20+ volt spikes commonly observed. The choice of electrolytic-only filter in the globe also potentially puts the LEDs at risk, as fast transient spikes from electronic transformers are likely to have frequency components well above the capacitor’s frequency response and will thus rely on the switching converter feedback to “compensate” for it (if its feedback bandwidth is high enough). In the worst case, these spikes will result in periodic excess current reaching the LED causing flicker and premature overstress and failure. The top side of the PCB is marked MR16D2, and overall, the globe is very “anonymous” giving virtually no clues as to the manufacturer. The input side has a bridge rectifier made by four discrete surface mount SS14 Schottky diodes, which explains why they gernerally work well of DC. An extra diode is used as the freewheeling diode for the output from the inductor. The whole operation is controlled by a single SOP-8 integrated circuit from Silan Microelectronics – the SD42522 – a fixed frequency 6-36V input, up to 1A output constant current step-down driver with integrated MOSFET and “jitter” (spread spectrum) function. Arrangement of the LEDs in such consumer products can have a bearing on the cost, lifetime, reliability and failure modes of the device. My preferred arrangement sees all the LEDs connected in a single series string. 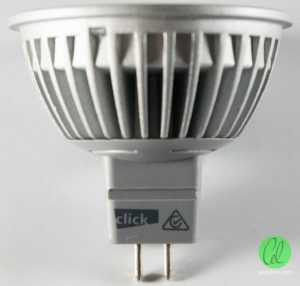 The advantages of this operation is that all LEDs are subjected to the same stress as they are operated at the same current, and they are all at the same brightness. The main disadvantage is that any one LED failure in an open circuit mode will take down the whole array and result in complete failure. It also requires a higher output voltage, which may require additional insulation requirements to ensure safety. The other commonly used arrangement is a multiple parallel arrangement like this unit, which allows for lower voltage drivers, and simpler insulation requirements. It also allows the use of step-down converters like in this design. With the right design, it can be possible to make them tolerant to single or multiple string failures as long as the LEDs are operated well below their rated maximum ratings. In most cases, this is moot as cost-reduction dictates that they are operated near their maximum ratings, so single LED failures accelerate the failure of the remaining strings, thus causing a moderately-rapid cascading failure. In such a design, current balance is not a given, and careful picking and matching of LEDs might be needed to improve the balance. Ensuring even temperature of the strings are also important, or providing some feedback mechanism to ensure string currents are balanced (at some cost of energy). At greater cost, the issue might be entirely mitigated with multiple independent LED channel drivers for redundancy. Brightness of each of the strings are not ensured to be consistent either. As a result, there isn’t just one configuration that meets all the necessary objectives of efficiency, cost, complexity, size, and output voltage limitations. Further to this, when it comes to MR16 globes, they are subjected to whatever the input power source is. With iron core transformers, it’s a relatively gentle analogue of the incoming mains, which is kinder to electronics, however, with electronic transformers, the output is very spiky. This is especially true as many electronic transformers were designed for a 50W incandescent load with a ~10W minimum loading. 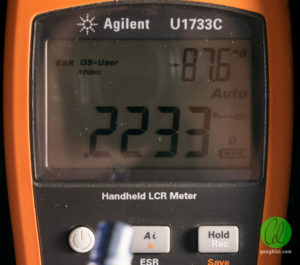 When loaded below this level, the output cannot be guaranteed to be stable, and often contains much higher voltage spikes at high frequencies. 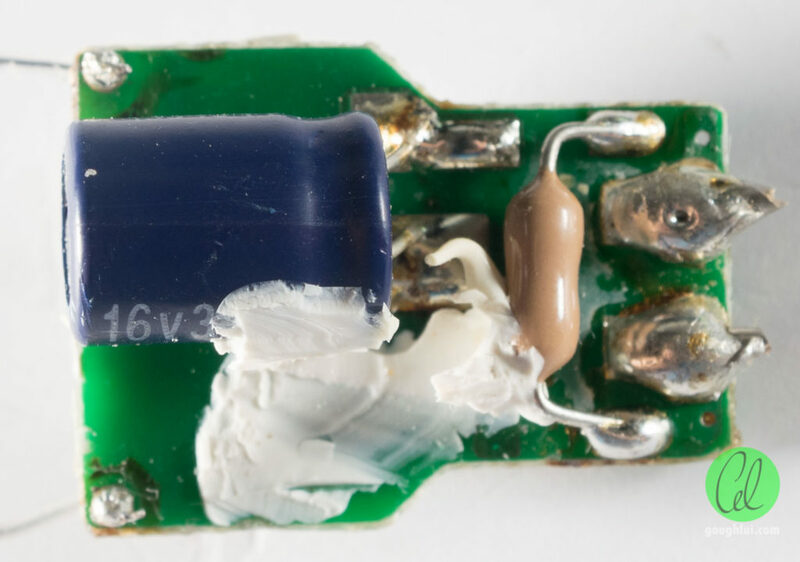 These are taxing on filter capacitors, and require good filtering to “smooth out” – electrolytics alone may not be enough. This spiky power also has the potential to cause acoustic problems with buzzing of globes and visual flickering of globes. Dimming reliability is also a big issue for those globes which can be dimmed. 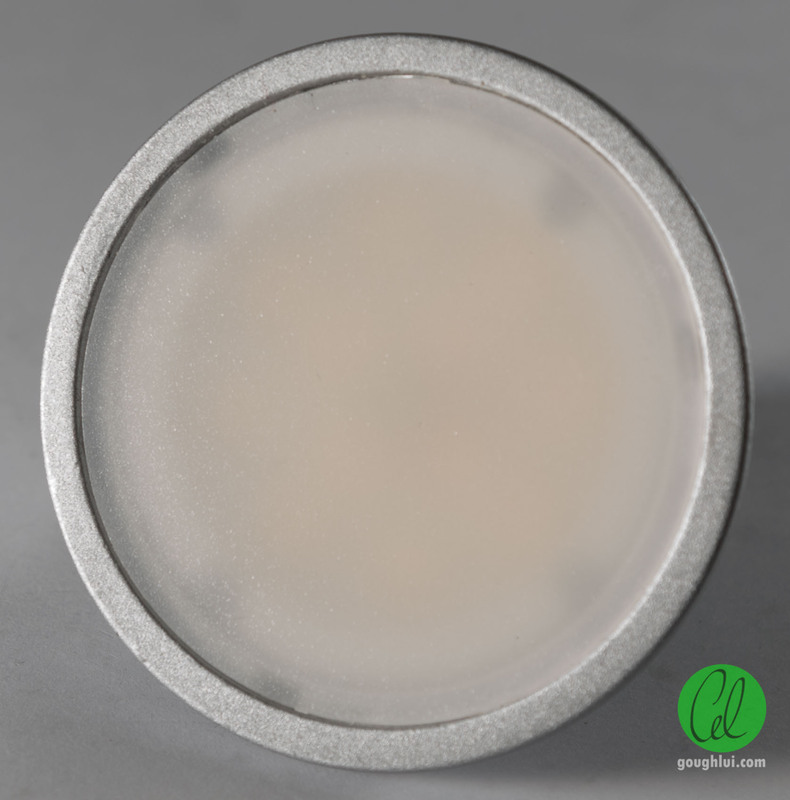 As a result, for these downlight fittings, the best result seems to be achieved by replacing the fittings entirely, with LED integrated fixtures which are designed as a system to have long LED lifetime, consistent power delivery, and good thermal and optical characteristics. Short of this, investing in more expensive, branded globes which aren’t some “local import brand”, or are the brands that electrical tradespeople use (i.e. of commercial, rather than consumer quality) might be the way to go to avoid such issues. 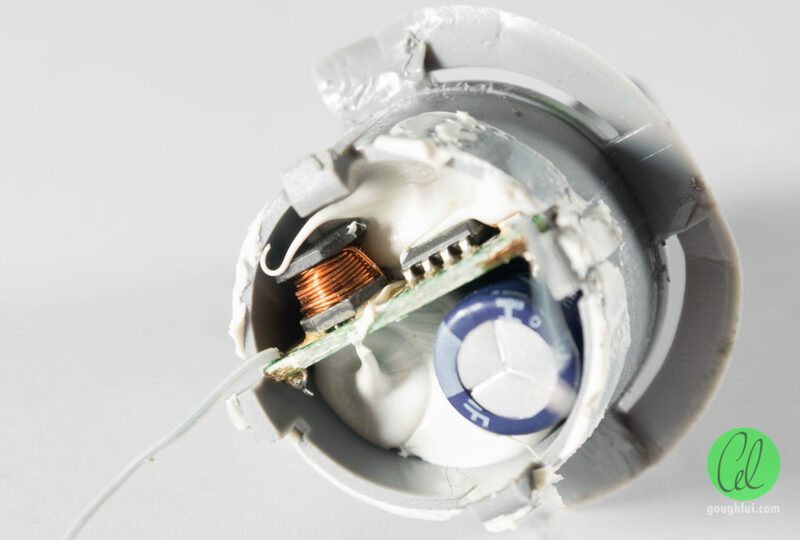 A Click branded LED downlight replacement globe was torn apart and examined, and its configuration was determined. The manufacturer of the globe could not be determined, although it is presumed that the globe had failed well short of expected lifetime. The design seems to have been chosen to ensure the output remains in low-voltage realm to simplify insulation and construction requirements. It seems to be designed to operate with an integrated step-down converter from a (nominally) 12v input that could be as low as 11.5v. 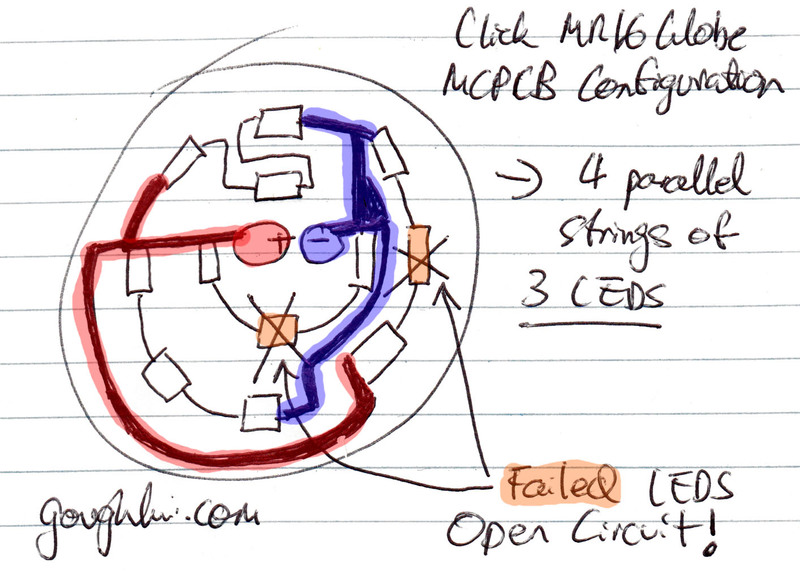 A total of two LEDs had failed open circuit resulting in the loss of half the LED array which prevented the globe from running stably. The globe likely experienced a cascading failure mode after the loss of the first LED, and the design and construction seems to have some shortcomings which acted to further encourage LED failures including a four-parallel string design with no current balancing feedback, poor thermal conductivity in interface material with uneven thermal loads across the MCPCB and possibly ineffective input filtering against fast large-amplitude spikes from underloaded electronic transformers. 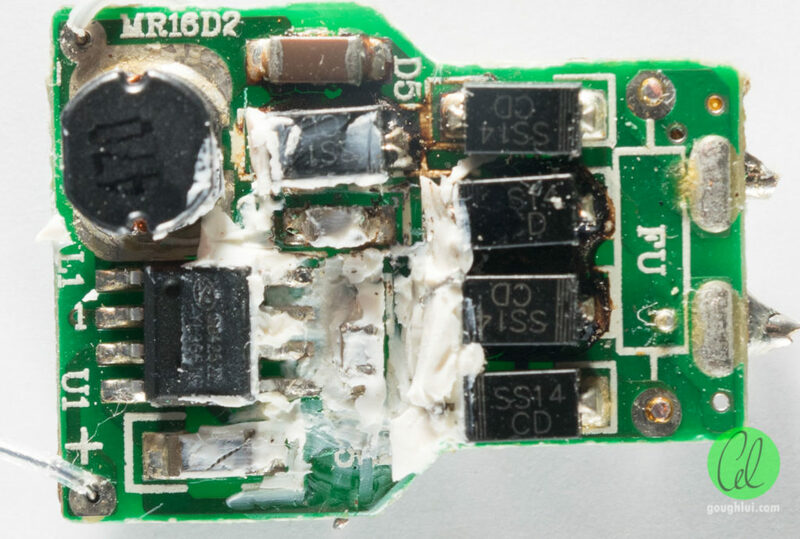 This entry was posted in Electronics, Lighting and tagged analysis, fail, failed, led, lighting, teardown. Bookmark the permalink. ^^^ I’m not sure if that is the case for electrolytic capacitors, but I have seen impedance curves for MLCC’s which show a bowl-shaped impedance curve. ^^^ You should see this cheap bench PSU I have … it’s main filter capacitor has the same deal going on. It’s a genuine looking Rubycon capacitor, and it tests OK on capacitance (dunno about ESR, don’t have an ESR meter! :S). That thing gets a few volts more than it’s maximum rating (either 50 or 63V, can’t remember), but it hasn’t appeared to have hurt it! Thanks for the comment – agreed on the impedance as sometimes it’s not as obvious as my intuition would lead me to believe. Too late to check now, it’s long in the bin. As for exceeding the working voltage – I’ve seen more extreme examples, but really they are pushing the dielectric and “eating” into some manufacturing reserve (i.e. rated for 16v but could probably handle 25v before instant failure) and likely would accelerate any failure mode of the electrolyte and dielectric by putting it under maximum stress all the time. It just is a “bad” idea, but definitely a cost and “space” saver as often one voltage step up is a larger (physically speaking) capacitor.